The intercampus Route is two routes that operate bidirectional around City Campus then both routes transport to East Campus by the #24 and #25 StarTran buses. 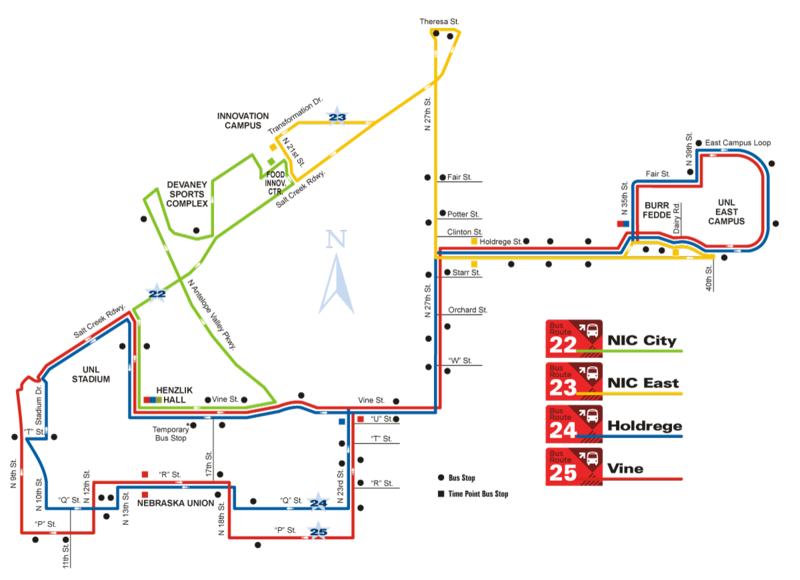 The Intercampus Route #24 Holdrege operates from East Campus to City Campus (clockwise) via 27th Street, Vine, 23rd, Q, 18th, R, 13th, Q, Stadium Drive, Salt Creek, 14th, and returning to East Campus via 27th and Holdrege Street. The Intercampus Route #25 Vine operates from East Campus to City Campus (counterclockwise) via 27th, Vine, 14th, Salt Creek, 9th, P, 12th, R, 18th, P, 23rd, Vine and returning to East Campus via 27th and Holdrege Street. When classes are not in session, the campus bus daytime schedule changes to reflect lower passenger demand. The bus schedule adjusts to a 20-minute wait between buses on City Campus and a 10-minute wait on East Campus. The on-call van service is also not available during this time. There are 4 StarTran buses operating each route during daytime service and 2 buses during evening time service. Daytime (7:00 am - 6:00 pm) bus service is scheduled to depart each stop in ten (10) minute intervals beginning 5 minutes after the hour; for example 7:00 am, 7:10 am, 7:20 am, 7:30 am, 7:40 am, 7:50 am etc. Evening time (6:00 pm - 9:00 pm) bus service begins at 6:10 pm is scheduled to depart each bus stop in 20 minute intervals beginning 10 minutes after the hour, for example, 6:00 pm, 6:20 pm, 6:40 pm, 7:00 pm etc. There are 4 StarTran buses operating each route during day time service and 2 buses during evening time service. Daytime (7:00 am - 6:00 pm) bus service is scheduled to depart each stop in ten (10) minute intervals beginning 5 minutes after the hour; for example 7:05 am, 7:15 am, 7:25 am, 7:35 am, 7:45 am, 7:55 am etc. Evening time (6:00 pm - 9:00 pm) bus service begins at 6:00 pm is scheduled to depart each bus stop in 20 minute intervals beginning 10 minutes after the hour, for example, 6:10 pm, 6:30 pm, 6:50 pm, 7:10 pm etc.